Click here for a full-screen view of the Arts Crawl map. In a smorgasbord of the performing and visual arts at Bates, the college presents its first-ever “Arts Crawl” starting at 5 p.m. Friday, Jan. 28. Art exhibitions at the Bates College Museum of Art and in Chase Hall. A map and schedule will be available. The Arts Crawl will be followed at 7 p.m. by the annual Asia Night of student performances, food and fashions in Schaeffer Theatre (which takes place again at 7 p.m. Saturday, and is also open to the public at no cost). For more information about the Arts Summit, please contact 207-786-6381 or nsalmon@bates.edu. The Arts Crawl follows the college’s first Arts Summit, held earlier in the week, which brought visiting artists to campus to explore ways of enhancing the role of the arts and community involvement in the arts. 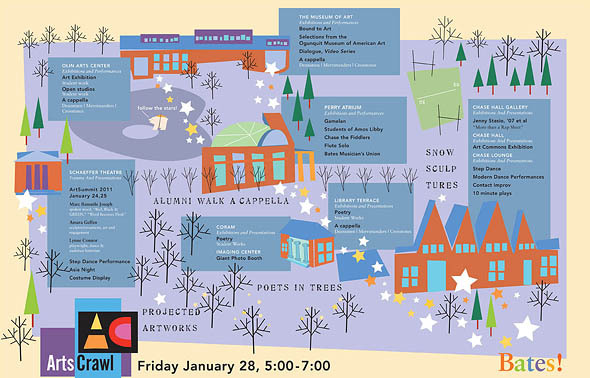 Both events were organized by the Bates Arts Collaborative, a staff-faculty group furthering the arts at Bates.